Hi guys! 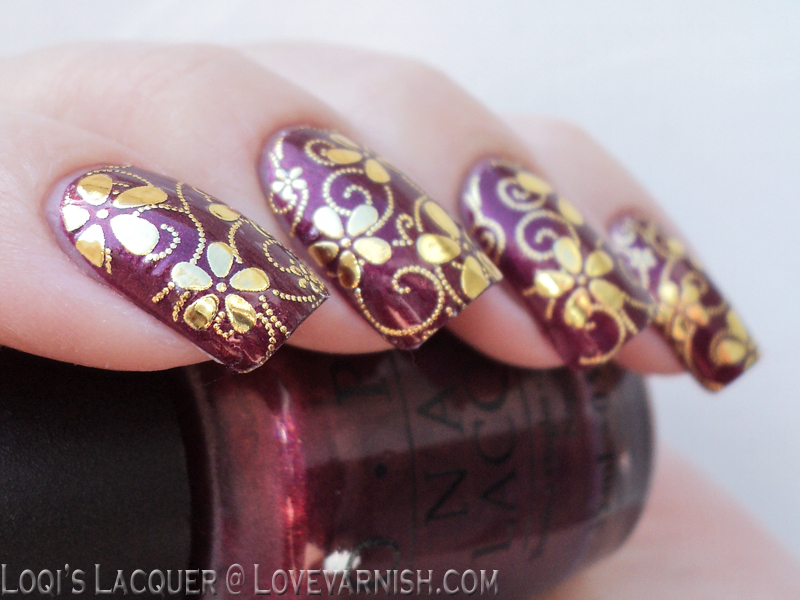 Back to nail art again this week. A while ago I was approached by Ladyqueen, a beauty and accessory website, asking if I wanted to try some of their nail art goodies. So today I've got some flashy nail stickers to show you! So, nail stickers, a product I've actually never used before! Kind of weird, because they are available everywhere and in all kinds of shapes and sizes, but I just never got around to them. So I was excited to try them out. 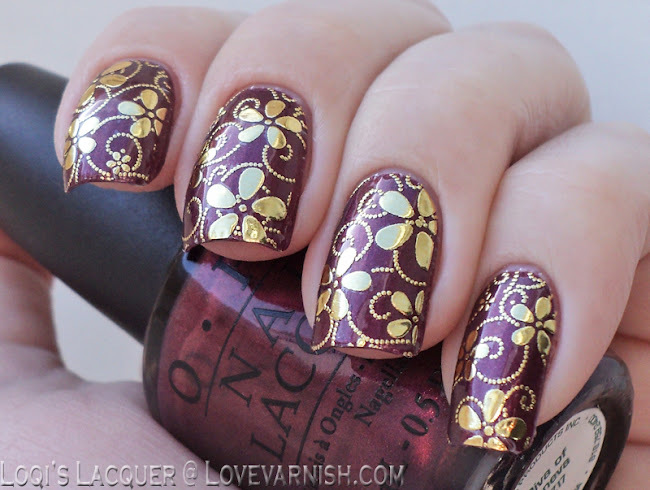 The stickers I got from Ladyqueen are full nail images with a gold foil look. They come on a large plastic sheet with 9 different designs per sheet, and there are 4 different sheets to choose from. Each row of designs has 2 x 6 stickers in different sizes, so you can pick which size fits each of your nails best and have some spare. Application was very easy. 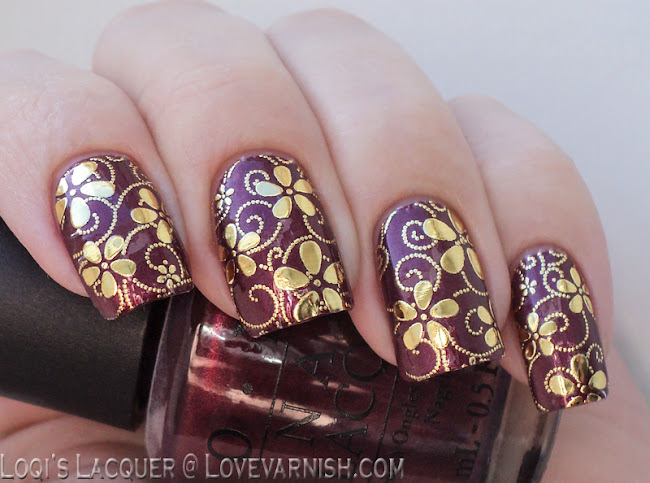 I started out with a nice base of OPI Diva of Geneva, a gorgeous purple shimmer with a hint of gold, which I thought would pair beautifully with the gold stickers. I then matched the stickers sizes to my nails (they were all the perfect width for my nails! I didn't have to cut any of them, but you can if you have to). 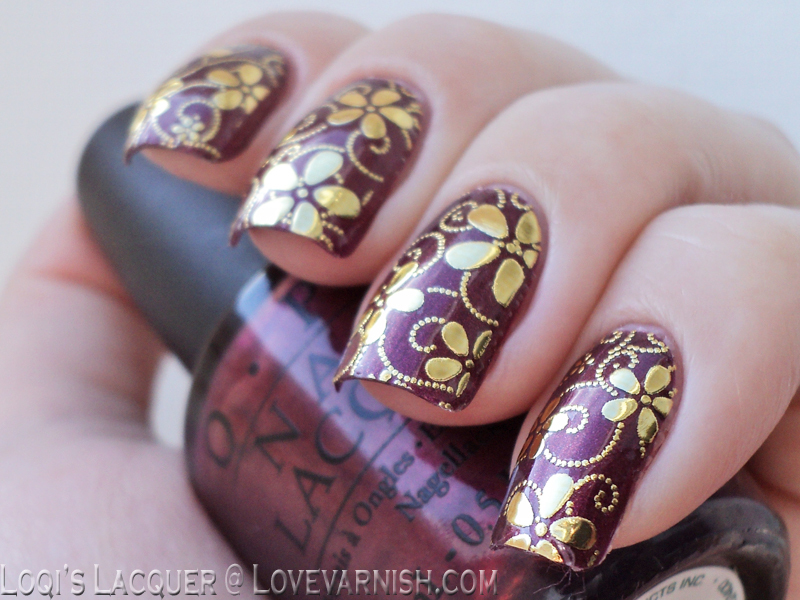 To apply them I lined up the rounded tops to my nails and placed them in the centre. I then smoothed down the sides with my finger. I then filed of the excess, and done! You don't need to apply topcoat, since these are plastic and cover the whole nail, it would simply flake off again. You have to be careful when applying though! If you apply these crookedly you cannot remove and place them again. The stickers adhere quite strongly and tear when you remove them. I didn't have any problems with them though. They smoothed out perfectly without wrinkles. I really like how these turned out. When I saw the stickers on the sheet I was afraid they were a bit too 'bling' for my taste, but I really liked them once they were on the nail. And application was very easy! However... the wear time on these was pretty bad. When I applied them they adhered so strongly I thought they would last a good long while. At the end of the first day though (I applied them in the early afternoon) they already started to lift at the edges. It wasn't too visible at first, but they quickly started to lift further, and by morning they were all torn all around the edges. I'm a bit on the fence about these to be honest. I really really loved how they look on the nail, especially because I was afraid they would be a bit 'too much'. And they applied wonderfully easy and fit my nails perfectly. But the wear time was really bad and I wasn't able to really enjoy them before I had to take them off again. Knowing this though, I would use the other 8 sets to do quick and easy yet really flashy party manicures that only have to last one night and be happy. What do you guys think? Do you like these stickers? And would you use them for a one night only 'party' manicure? Please let me know in the comments! Ladyqueen is a online beauty shop with free worldwide shipping. They sell a wide range of nail related goodies like stickers, decals, studs, tools and lots more. If you want to check them out click on the link below! Also, if you are interested in getting some goodies you can use the code PHLC15 to get 15% off your order.